TVB modern comedy, Queen Divas <新抱喜相逢>, premieres on Monday, January 20 at 9:30 p.m. following the completion of Coffee Cat Mama <貓屎媽媽>. 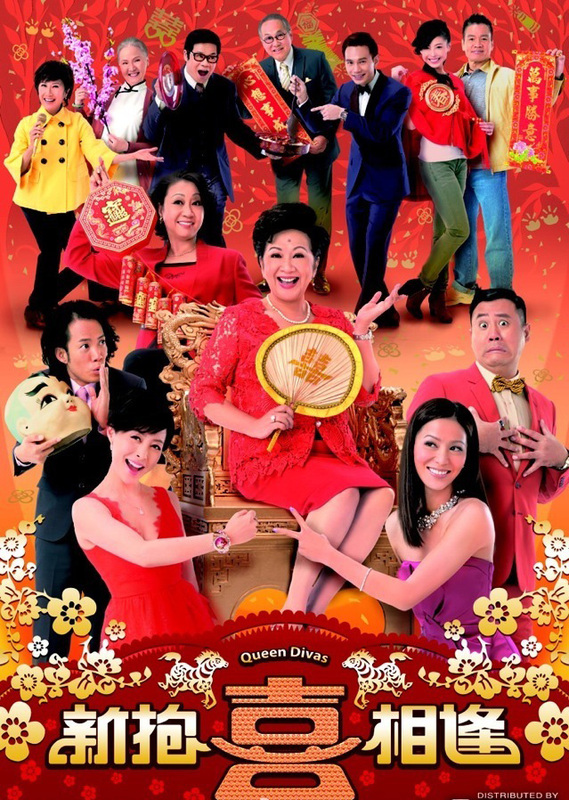 Produced by Kwan Wing Chung (關永忠), the series contains 15 episodes starring Nancy Sit (薛家燕), Joyce Tang (滕麗名), Ngo Ka Nin (敖嘉年), Angela Tong (湯盈盈), Evergreen Mak (麥長青), Anderson Jr. (安德尊), Yuen Qiu (元秋), and Jonathan Wong (王梓軒). The drama revolves around a rich family under charge of a scholarly woman, Ho Siu Lan (Nancy Sit). She acts as the head of everything and everyone, even controlling business transactions of her husband’s managed companies. Her eldest son, Lin Chi Sam (Evergreen Mak), and second son, Lin Chi Kit (Ngo Ka Nin) have yet to marry, but both secretly fall in love with popular actresses within the entertainment industry. Siu Lan ultimately disapproves after discovering her two sons’ underground relationships, but was eventually forced into helplessness to accept them into the family. 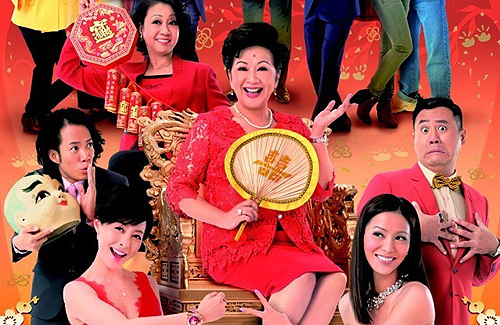 Chi Sam marries Kwok Fei Fei (Joyce Tang), who is known as the queen of tragedy within the entertainment industry, while Chi Kit marries the queen of comedy, Man Choi Ling (Angela Tong). The plot takes on an interesting spin as both women fill the household with tears and laughter due to their rivalries as actresses. On the other hand, Siu Lan hides her disapproval of her two daughter-in-laws by acting politely, yet thinking otherwise. The family members’ acting skills are all put to the test as different events being to unfold. As it is a comedy, many jokes will break out and induce laughter from the audience. Nearing the end of the series, Siu Lan finds out someone has resulted in the loss of all her husband’s company’s assets, pushing the family into a state of crisis. It is this issue that gradually uncovers everyone’s secrets within the family…. Sounds good and the cast can act! Yay! YAY! I am very excited for this! Wow.. Even Yuen Qiu is acting in this!! Judging from the poster, I think it is because it’s a drama tailored for the Chinese New Year season. Like the love theme short series which was released during Valentine’s last year. The plot is interesting but the choices of actors is debatable. I just don’t see how Angela Tong can be successful in semi lead after her disastrous 1st time lead in that awful series with Bobby. Can’t they find an actual comedic actress to play the queen of comedy? agree with funn,the leads are not really you say wow that can attracts me to watch this serie,and the most comedies from tvb is crap lately,so i’ve not really much expectatations. I don’t agree with Funn…. I seriously see potential in Angela Tong. I have seen her in that comedy drama with Nicky Cheung and Maggie Ho, she was a great comic relief imo. Not only them. Kelvin, Bosco, Raymond, Kenneth, Linda too. Yes, if they keep it up. I will start thinking the company only consists of these 8 individuals. I don’t like Angela Tong as well. But they probably can’t find anyone else. Can’t stand watching her. She’s has those creepy nostrils that shows too much. Me three can’t stand Angela Tong. Joyce kinda looks like Queenie Chu in that promo shot. D plot sound ok..but dono tat there is someting about Angela Tong tat i dont reli like to watch her. Finally..something I think I can look forward to. really looking forward to this! i like all the casts! Cant wait to watch: Angela, Joyce, Pierre and Evergreen !!! Some of the most underrated actors in TVB! Yay Nancy Sit is back! Finally Joyce gets a bigger role again! I wish she would be in more series. What happened to the show? I saw 13 shows and then it disappeared from TVB Schedule. Did it get cancelled?